This is a book that most would consider a young adults boom but I have to say that it has very grown up aspects to it. The characters in this book are seniors in high school and yes they act as seniors do so that in its own is a good thing. 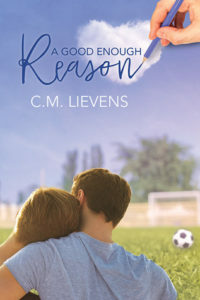 There are too many books and shows for that matter that have kids in school act more like adults so that is one of the things that I want to commend CM Lievens on. It is not easy in my opinion to write a book about young adults in adult situations and not lose perspective on that fact they are not adults. Ellis is definitely a strong character in this book. He has to insure more then his fair share of crap around school because of people speculating that he is gay when only a select few know the truth. But worse then that is the bullying that is escalating with Mark. What started out as bullying turned into obsession and Ellis fought back against it when most would hide away. Ellis indured things that no one should EVER have to go through and he came out the other side intact and with his head high and not backing down. Ellis is definitely a role model for others in my opinion. Dale was the one that I think gave Ellis his strength to stand up for himself. No one ever suspected anything about Dale being Bi but when it came to Ellis he embraced it and stood by Ellis each step of the way. Dale is also agood role model in my opinion for others. This book was an amazing book. I was enthralled throughout the whole book and enjoyed it immensely. I think CM did a superb job on it. Would definitely recommend that others read it.